What a difference Dr. Krongrad made in my life! 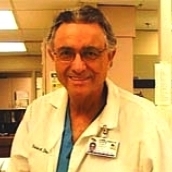 I could have had another surgeon, or another method in which the cancer MAY have been removed, but I felt the least invasive procedure, laparoscopic radical prostatectomy (LRP), coupled with the most experienced surgeon, Dr. Krongrad, was by far my best choice. I suppose that LRP and Dr. Krongrad are synonymous, but this is getting ahead of my story of this remarkable surgeon and his procedure. I am a 67 y/o retired Navy Chief Hospital Corpsman, having served 20 years not only with the Navy, but with the illustrious Marine Corps as their "Doc." I am now a full time medical technologist in Jacksonville, Florida. I commenced having elevated prostate PSA tests in 1997, ranging from 4.5-9.0 ng/ml. Over the next 7 years I had 3 biopsies. Prior to the second one, I was given an antibiotic for a week. This resulted in lowering the PSA 2-3 ng/ml., giving me a diagnosis of chronic prostatitis and the comment, "This is really nothing to worry about at this stage. Let's wait a year and repeat the PSA prostate specific antigen. If it is increased, we will perform another prostate biopsy." My wife and I were not pleased with that comment, but were not really sure what to do about prostate problems. We waited the year. Again, same procedure, same result. Next scene: different urologist. Another biopsy with new results: cancer with Gleason score 6. I had heard of Dr. Krongrad and the Laparoscopic Radical Prostatectomy procedure only through the 700 Club and the Rev. Pat Robertson. He had had the procedure and if you haven't watched the informative dialogue between him and Dr. Krongrad, it is on the home page of this website. As soon as I received my cancer diagnosis in April, 2004, I called Dr. Krongrad's office and spoke with the very efficient Hope and/or Ruth who immediately put me at ease. She asked me many questions regarding my basic health (I am a diabetic), insurance issues, and then she faxed me several forms and a "to do/not to do list" explaining any preparations necessary prior to coming to the Fort Lauderdale/Miami area. They faxed two additional medical history forms and questionnaires to be filled out and returned to them. When you, the prospective patient are on the LRP schedule, ask for a listing of some former patients. I contacted several of them and had an open, honest sharing of personal information. Since my surgery, Dr. Krongrad has given my name and phone number, and I am more than happy to explain the procedure and my post laparoscopic radical prostatectomy healing. I was scheduled for hospital pre-admission on June 7th, and then to Dr. Krongrad's office for scheduled personal meeting. When I arrived at pre-admission, I thought I would be there for an extended time, and was concerned that I may be late for my appointment with Dr. Krongrad. My wife suggested I call Hope. Great idea! That brought the expected results. What a gal! Within 5 minutes a nurse came to the waiting room and asked if anyone was Dr. Krongrad's patient. The rest of the administrative procedure went like clockwork. Our first meeting with Dr. Krongrad was a question and answer period. At the outset it was more formal and professional, but as time went on, I became more relaxed, knowing the questions were for my own good --- such as why did I choose LRP over other methods; was I comfortable with my decision, etc. My wife and I were very impressed with his patience, thoroughness, and professionalism. It is important that you are intelligently informed as to why you chose the LRP procedure. I was, and I knew beyond any doubt that I had selected not only the correct route of eliminating the cancer, but the correct surgeon. After the meeting I went back to the hotel with instructions to drink only non-carbonated, non-caffeinated liquids, and nothing after midnight. Surgery was scheduled for the next day at 0730. I had no fear, possibly in part because of Dr. Krongrad's assurance, and because I had had 2 previous general anesthetic operations (bilateral carotid and subclavian bypass surgeries), and had little or no effect from the anesthesia. For this procedure, I only remember going into the O.R., seeing the surgical monitor, and asking how long it would take: the response was 2- 2½ hours. Being a medical technologist, and a former Navy surgical tech/assistant, I was fascinated with the instrumentation of the laparoscopic procedure found in the technical manual which you can read on this web site. The advantages of robotic prostate surgery allow the surgeon and his assistant unparalleled control of operating the instruments for the technically demanding LRP procedure. A most memorable experience!! I had not only my prostate removed, but also a very large attached benign growth of the prostate ("intravesical lobe"), which was not seen during the former biopsies due to the location in the bladder. Dr. Krongrad said this was a rare occurrence and he would never forget me or my prostate. A few hours post surgery, Dr. Krongrad came by the hospital room and was pleased that I wanted to get up and walk. That was a remarkable sensation! A slight pain getting into position to stand was the only discomfort. Never would I have imagined it so easy after major abdominal surgery, even though I had read it from previous patient's testimonials. On Wednesday, I walked several more times, and later was discharged back to the hotel. Thursday afternoon I met with Dr. Krongrad for the last time in his office. My surgery was not only a success, but the pathologist report implied that I was cancer free!! I had very little pain, and required only Tylenol a few times. I lost little blood, nothing compared to the probable 3-4 units of blood (because of the extended surgical time that was required to extract the large tumor attached to the prostate) that may have been needed had I chosen the open prostatectomy. My PSA is now 0.04ng/ml!! My wife and I enjoyed the area 2 more days, and then I drove 325 miles back home with no pain, and only the inconvenience of having to empty the urine bag at rest stops, etc. Two weeks after surgery I had my catheter removed. I have discovered that wearing ultra absorbable briefs, similar to undershorts work fine. I only had to change them once or twice during the night, and now not at all. I learned that I had to fore-go regular coffee until the incontinence was more or less in control a few weeks later. To those of you who are reading these testimonies, I presume you have received the news of having prostate cancer. Allow us, as former cancer patients to tell you to do yourself a life-changing favor, and call Dr. Krongrad's office for an opportunity you will never forget. I haven't, and I tell everyone I come in contact with, including the men in my large church you have nothing to lose, and everything to gain by choosing LRP and Dr. Arnon Krongrad. They were not sure what to do about prostate problems.